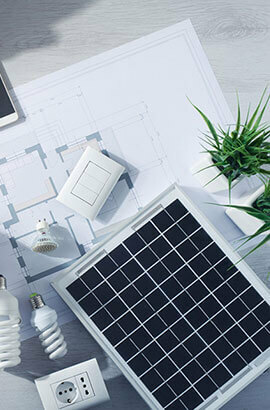 Photovoltaics were initially solely used as a source of electricity for small and medium-sized applications, from the calculator powered by a single solar cell to remote homes powered by an off-grid rooftop PV system. As the cost of solar electricity has fallen, the number of grid-connected solar PV systems has grown into the millions and utility-scale solar power stations with hundreds. Solar power is the conversion of sunlight into electricity, either directly using photovoltaics (PV), or indirectly using concentrated solar power (CSP). Concentrated solar power systems use lenses or mirrors and tracking systems to focus. A solar cell, or photovoltaic cell (PV), is a device that converts light into electric current using the photovoltaic effect. The first solar cell was constructed by Charles Fritts in the 1880s. The German industrialist Ernst Werner von Siemens. We make clean energy available to homeowners, businesses, schools, non-profits and government organizations at a lower cost than they pay for energy. © 2016 Design by Technosapphire, All rights reserved to Shanti Solar.